The Olympic Sportswear kit for the 1999/2000 season was designed to help commemorate the 90th Anniversary of the Club’s formation. 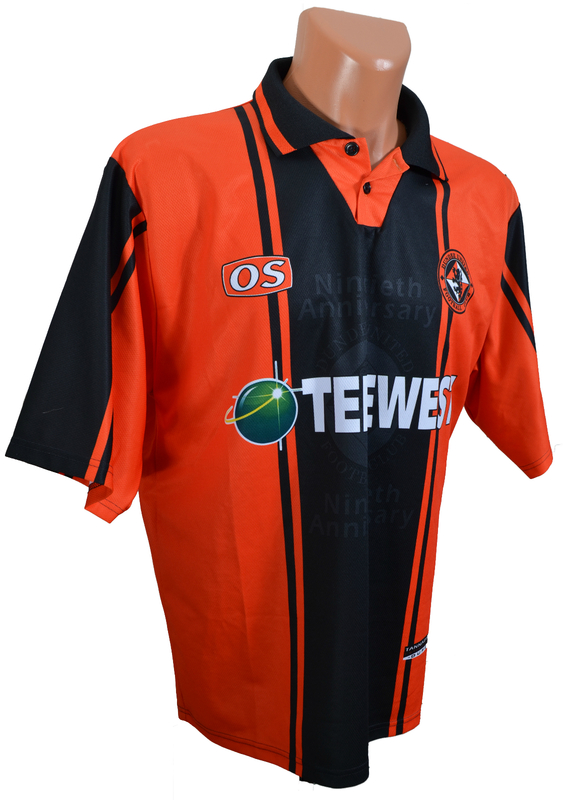 The tangerine shirt had a thick black stripe running vertically down the centre, and printed into the material of the black stripe was a large opaque version of the Club badge, with the words “Ninetieth Anniversary” above and below. The sleeves also had a similar stripe down each arm. The polo style collar had a V shaped tangerine placket with two buttons. For the first time, the Club badge and manufacturers logo were printed into the material of the shirt, instead of being sewn on to the shirt – a touch that some fans liked, and some fans hated. The Telewest logo from the 1998/99 kit remained the same, again printed into the material. The shorts were a standard black with tangerine strip down the sides, and the Club badge on the bottom right. The tangerine socks were the repeated from the 1998/99 season, tangerine with black trim and a single black band. The kits competitive debut was a 2-1 win over Dundee at Tannadice in the opening game of the 1999/2000 season. It was used for only the one season, as United sat in third place in the SPL by December. But Paul Sturrock's team struggled with the mid-season sale of Billy Dodds to Rangers, and by the end of the season they were only 6 points above bottom club Aberdeen after losing the last 6 games of the campaign. Olympic Sportwear went into receivership in January 2000, and it took United until May to strike a deal with another company for the next season.